Renzi calls on the constitutional referendum: what are the (updated) odds? Alessio Terzi constructs model using poll data to assess potential outcomes of the Italian referendum. “What will you do if the NO prevails in the end?” was the question the Italian Prime Minister Matteo Renzi received on Monday at a crowded rally in Bergamo from an evidently concerned senior supporter who had just tapped on his shoulder. Italians are being called to the ballot boxes on 4 December to either confirm or reject Constitutional amendments put forward by the government. The changes are largely aimed at transforming the Senate in a consultative body and re-organising the distribution of competences between the central and regional governments. Following Brexit, and more recently President Trump’s election, the Italian #ReferendumCostituzionale could represent the latest blow to the ruling elites of a Western country. To assess the likelihood of such an event, ten days ago I constructed a probabilistic model based on poll data. While recent political events lead us to treat poll data with a fair degree of caution, this quantitative evidence should nonetheless be an integral part of more holistic qualitative forecasts of the vote. The original model assigned roughly a 60% probability to the YES camp prevailing in the end, though the race looked incredibly close. Since then, I have updated the model to incorporate fresh polls and the picture has started to look grimmer for the current Prime Minister. Following a series of poor poll performances, the model now assigns a 73% probability to a NO victory. 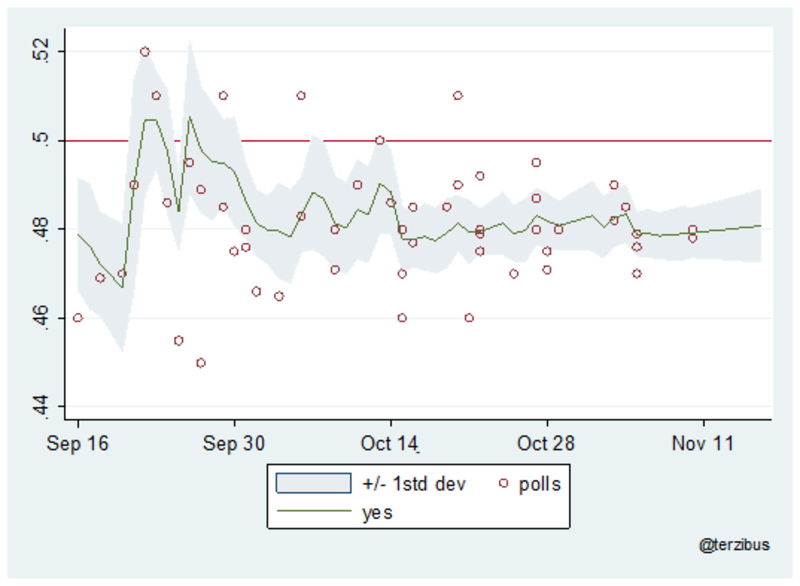 As discussed in the previous article, the original prediction rested on the fact that the model had detected a nascent positive trend in the YES vote starting around mid-October. However, as can be seen below, this trend was interrupted at the beginning of November. As the referendum day approaches, the likelihood that the YES camp might re-gain momentum has therefore shrunk. The model now forecasts the NO camp to garner a majority of votes (51.2%), although the race remains extremely close. As such, even small changes in the turnout rate, or the vote of Italians abroad, could easily twist the final result. In the end, if there is one thing the American election taught us is that when a model forecasts a 70% chance of winning, it also forecasts a 30% chance of losing (see “The How-Full-Is-This-Glass Election”). “It makes sense to stay in power only as long as they let you get things done” was Renzi’s reply at the rally, demonstrating he is sanguine about his promise to resign in case of a NO vote. At the current forecast probabilities, the Italian Prime Minister seems to have chosen an incredibly risky bet to go all in. This blog post was originally published on 17 November, 2016 on Bruegel.org.